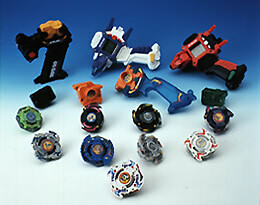 Beyblade toys are very popular in Japan, the UK and USA. Beyblade-toys.com is Daniels second website which he launched today. Beyblades is a battle game where spinning tops fight it out in an arena. Known as the bowl arena. I was amazed at how popluar this game is. Beyblades started in the 1990’s and although it sort of fizzled out in 2006 it has come back with a vengance with the latest series called metal fusion. The beyblade toys are a more recent addition and came as a result of the success of the Magazine and tv series. Daniel’s first website was www.bakugan-game.net which he made a few months ago. It does not earn him a fortune but is slowly growing in poularity and helps with his pocket money. If it continues growing as it is then he will be earning more than the UK average wage in less than a year. Not bad for a 12 year old who is writing about the games that he loves and plays on a daily basis. He has designed both of the sites himself (he is yet to upload the new beyblade theme) but I think he has done a great job and I am very proud of what he has done and achieved. Beyblade toys can be found in most toy stores as well as on amazon and it is big business. It goes to show that if anyone wants to make money online then it is possible. Daniel has also created a squidoo page on Percy Jackson whise bookes he has read a number of times. Once agian a very popular subject with loads of searches and something that he is really interested about. So, if you are wanting to make money online then make a list of your interests search google to find out what the competition is and how many searches are being done for the main keywords, buy a domain name and setup a blog. Easy peasy lemon squeezy. Check out his beyblade toys website and let me know what you think. Beyblade toys are great fun. Hi there, I have a silly question… My nephew said he wants beyblades for Christmas, and I haven’t got a clue where to start. I see lots of stuff and accessories… what all do I need to get? A stadium, the actual beyblades, the assembler..? what else?? Thank you so much!